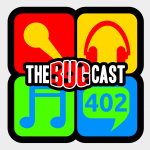 This week on The Bugcast: Caroline gives her selection of favourite tracks from the past year! The next live show will be episode 403, which will be broadcast live in the chatroom on Friday 1 April 2016 (no joke!) at 21:30 UK time (BST/GDT/UTC+1).